The wave-particle duality of light and other subatomic particles, such as electrons, is a central concept in quantum mechanics. The idea that light and elementary particles have both wave-like and particle-like properties is just one of a number of strange quantum realities. The quantum revolution, which began at the turn of the 20th century, has transformed our world from a technological standpoint. A century later the quantum laws underpin our modern technology. But scientists that were probing the atom in the early 1900s were simply trying to understand the nature of reality at the smallest scales. The challenges proved to be immense, mind-boggling and paradoxical. Wave-particle duality is one paradox that is still not completely understood. Albert Einstein is most famously known for the theories of special relativity, general relativity and the equation E=MC². However, in 1905 he won the Nobel Prize for his explanation of the photoelectric effect. Before Einstein, light was generally thought to behave like a wave, similar to a water wave. But there were some unsolved questions regarding properties of different colored light. Specifically, the ability of ultra-violet light to remove an electric charge from a metal plate (a phenomenon not observed with red light). Einstein proposed that light was composed of packets of energy called quanta (later known as photon). These particles of light acted like miniature billiard balls, knocking the electrons off the metal plate. According to Einstein, the particles from the red light carried low energy, because red light has a low-frequency. Conversely, the higher frequency ultra-violet light contains higher energy particles, which were able to dislodge the electrons from the metal plate. With the analogy of the billiard balls, it was like the ultra-violet particles were heavier than the red light particles. Therefore, the heavy particles of light were able to knock off the electrons, while the lite particles could not. The discovery of the wave-particle duality of light was only the beginning of the paradoxes that would later emerge. A simple experiment, known as the double-slit experiment would overthrow any common sense notion of the quantum realm. The experiment worked as follows: An electron gun was set up to fire an electron beam through a barrier with two open slits. A full screen was placed a small distance behind the barrier. One would expect that the electrons that go through the slits would strike the background screen and produce two bands. However, the outcome showed not two, but a number of bands across the length of the screen; a striped pattern emerged. The electrons were behaving like a wave; the stripes were consistent with an interference pattern. This had already been observed in water waves. For instance, when two ripples in a pond meet they interfere with each other, causing the similar interference pattern that was observed with the electrons. Water is composed of individual molecules and together they combine to form a wave. 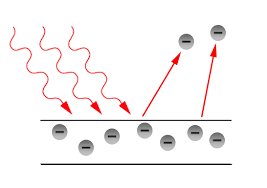 Similarly, the electrons were exhibiting both wave-like and particle-like properties (this was also observed in light). If this was not strange enough, the next step of the experiment would reveal a greater paradox. When the electron gun was allowed to fire one electron at a time, the screen in the back would eventually show the same striped pattern. How could single electrons produce an interference pattern? To point out how strange that was: it was like a single electron was passing through both slits at the same time, or like each electron was carrying information from the wave as it was passing through the slits. Danish physicist Niels Bohr, one of the founders of quantum mechanics provided a possible explanation. It is known as the Copenhagen Interpretation. According to Bohr, the electrons that travel from the gun to the screen cannot be viewed as single point particles, but rather as a probability wave. In other words, an electron exists only as a spectrum of possibilities when it travels. It carries with it every possible path from the gun to the screen, including passing through the two slits at the same time. Only when it strikes the screen is the electron forced to take an exact position. In this view, each electron will strike the screen at a different point, however, with a sufficient number of electrons the striped pattern will emerge on the screen. Whether the electrons are traveling in a continuous beam or as single travelers, the outcome will produce an interference pattern. Even if it is not completely understood, wave-particle duality is a fundamental property of the quantum world. In time, Bohr’s approach would lead to a revolution in technology. Even if exact outcomes cannot be known, physicists can calculate probabilities that will allow electronic devises to work. Similar to the double-slit experiment, even if the path of each individual electron cannot be known, the overall pattern can be predicted. Today, computers, mobile phones and GPS devices operate based on quantum mechanics. Brian Greene, The Fabric of the Cosmos.